Where ancient rituals rule in modern times — ‘Tis always the season! Growing up in New York, I rarely associated religious festivals with a national or even a city holiday, though occasionally alternate side of the street parking was suspended – to my father’s delight. It is a season when the complexities of Nepali society seem to surf above the capital’s physical chaos, pollution, political disorder and venality. The ties to yore, to myth, to custom and to religion may be a matter of worship or just a question of habit or a mere acquiescence to an insistent mother-in-law. 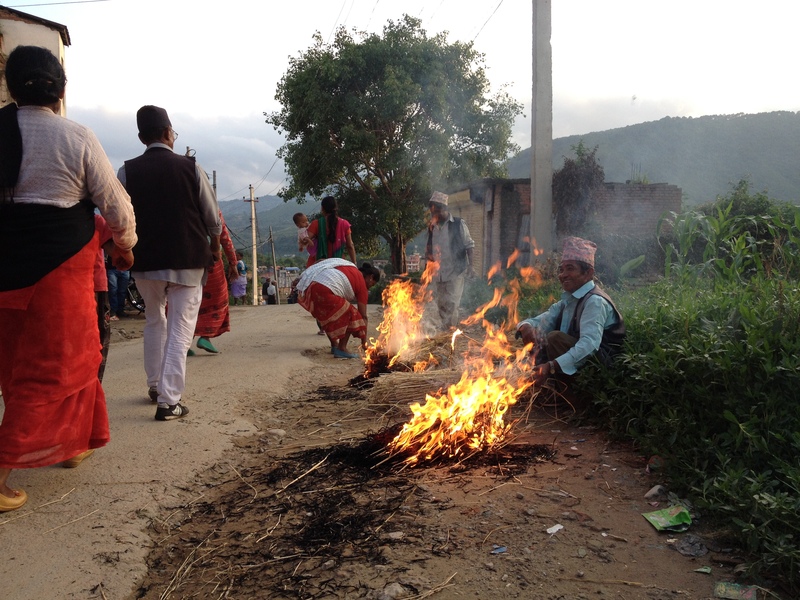 In any case, Nepal’s festivals are not a matter that can be ignored. Depending on how you look at it, life in Kathmandu either slows down as stores and offices close or it hums with an entirely different undercurrent. There are different colors, smells, noises. Traffic jams change locations. 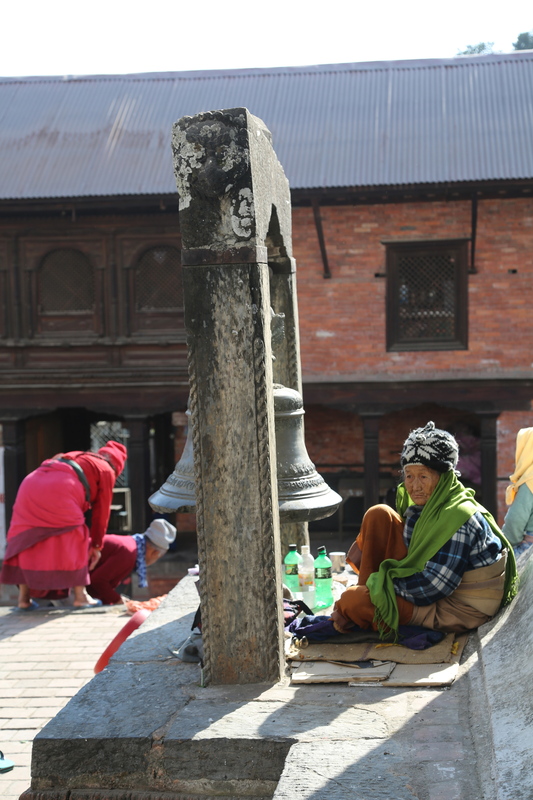 In Nepal, the kaleidoscope of Newar, Tamang, Chhetri, Brahmin and other holy days challenge the most ardent ritualists, who consult multiple types of calendars not only to stay connected with the outside world but also to follow the local customs. Most of the calendars are based on a lunar cycle, so every year, schools, offices and government nimbly have to readjust their schedules. To keep everyone on their toes, some holidays rely on astrologers. This year, the season began on August 10th, with Janai Purnima, when Brahmins and Chhetri communities go visit their guru to have their sacred thread changed. For good measure, there are those who add on a dip in a local river. Just a day later, on the 11th is Gaijatra or Cow Festival, a huge event in the Kathmandu Valley, when you decorate your cow or one of the many stray bovines in your neighborhood and join the dancing, singing parades. Some choose to wear cow head-gear. It is meant to pave the way towards heaven for any relative that has died that year. As the end of the month nears, there is Father’s day and close by the day when Hindu priests give (or more precisely sell) the faithful some ‘Kush grass’ so that Vishnu will live in their home for the coming year. Some festivals are all-inclusive, others pick their ethnic group, pointing in numbers to the changing ethnic powers in the Kathmandu Valley. Take Teej, which is followed by Chhetris and Brahmins but not by the Newars, the area’s original inhabitants. If color is a sign, then the Newars are far from being the majority they once were. 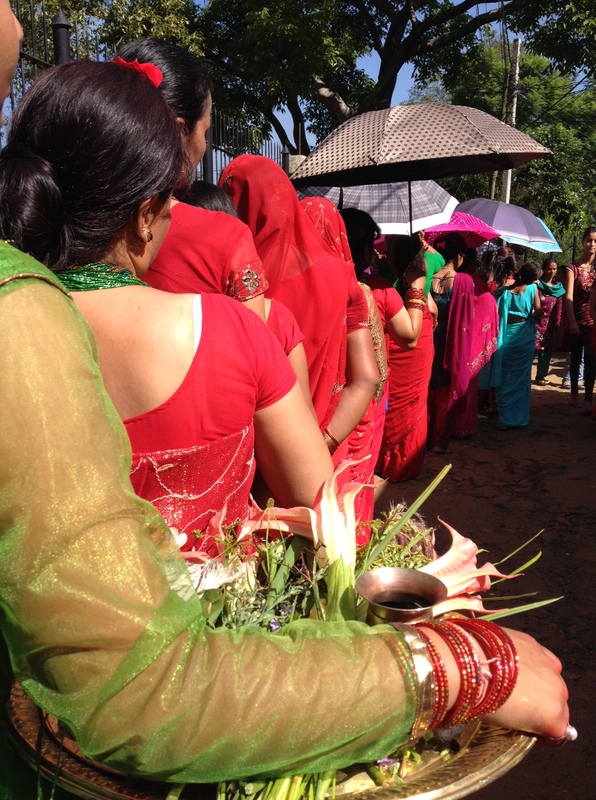 For the five days of Teej, observant women wear red saris, turning the entire valley into a red sea. The government closes down the roads in one of the busiest sections of Kathmandu so that thousands of red clad women can worship at Pashupatinath, one of the holiest Shiva shrines in the world. 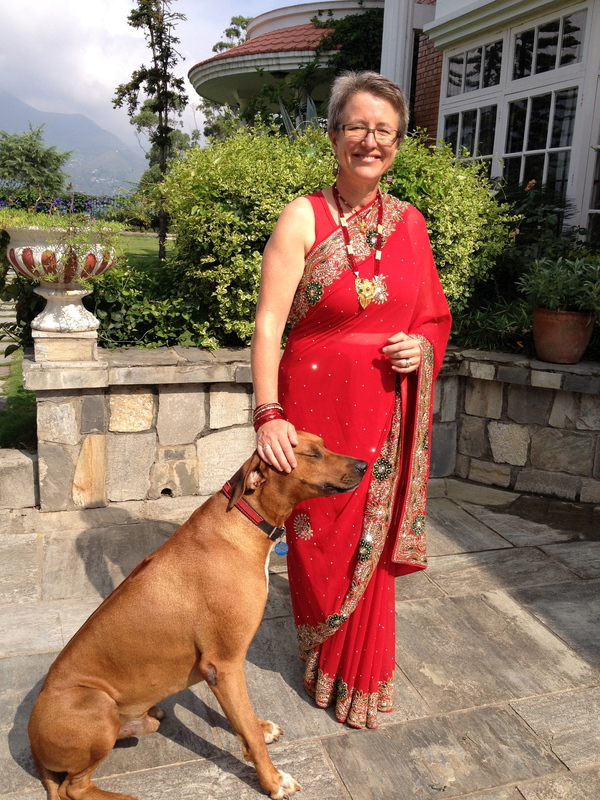 Red saris are scrunched against the windows of overloaded public buses or billow elegantly in an Isadora Duncan sort of way on the back of motorcycles. Teej is billed as a woman’s festival – but it is really about the men, for it is a time when a woman either prays for the well-being of her husband or, if she not already married, for a husband-to-be. If a woman is very traditional, she will fast and she will also bathe her husband’s legs and drink the run-off water. This has some of my women friends in the States decrying marital abuse. But watching these red saris dancing in front of temples, standing and chattering on endless lines with their girlfriends and daughters, puja (offerings) and smart phones in hand, all bedecked in traditional gold jewelry, it is clear that, for them, Teej is not only about bonding but also about a great escape from endless daily chores and demanding husbands. It’s a time of year when gold prices in Kathmandu skyrocket. I’m inclined to believe that if you acquire new jewelry and a new sari, and spend five days with your friends, worshipping a husband is a fair exchange. The festivities don’t end with Teej. A short break afterwards, there is an eight-day Indra festival in Kathmandu. More masked dancers and drums in procession with the Kumari Devi, or ‘Living Goddess,’ blocking more traffic. 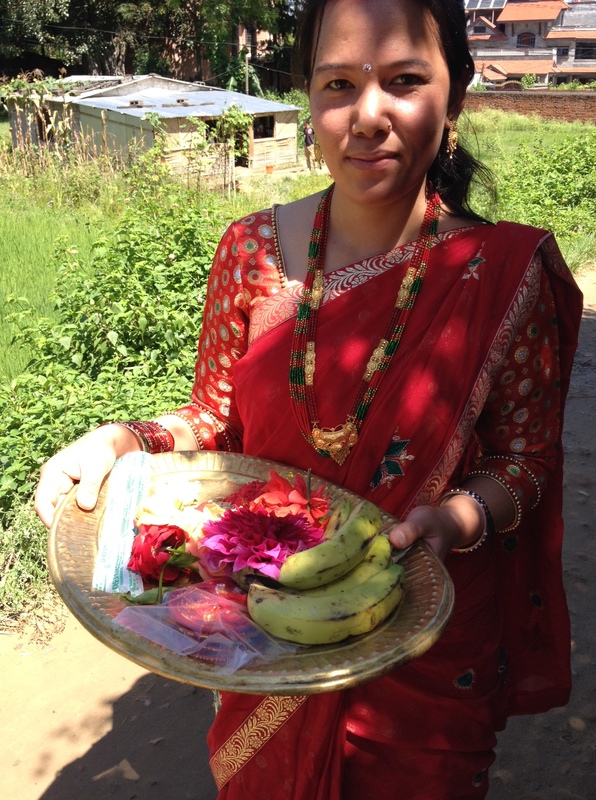 And then Nepal’s most universal and longest festival – Dashain – begins and continues for about 15 days. This year it falls at the very end of September. On the surface Dashain is a celebration of the victory of gods and goddesses over demons or of good over evil, but between the prayers, it is mostly a celebration of family and community. Flights into Nepal have already been booked for weeks now. Nepali migrant workers in the Middle East borrow money to return home, others fly in from the U.S. and Europe. Kathmandu empties out as families return to their ancestral villages spending long hours on buses and often walking the last bit to grandma’s old mud- wattle or stone house. Aside from hotels and a few restaurants in the tourist neighborhoods, Kathmandu shuts down. The sky is a jumble of kites maneuvred by young kids on rooftops. The chaotic traffic jams and the smog melt away. This is a time of sacrifice – animal sacrifice that is. My friend Keshav, has been fattening his mutton for three years just for this year’s holiday. On October 1st this year, the day will begin with the army’s ritual throat-slitting of scores of buffaloes and then everyone has the go ahead to kill and feast on their own buffalo or goats and the drain-less roads will be covered in blood. Even if you live in an apartment, there is pressure to buy and butcher your own animal. My favorite festival is none of these, but comes a bit later. After the dancing, chanting, techno-filled boom-blasted nights of Teej, just passed, I look forward to Tihar, the festival of lights, at the end of October. If poetry can transcend words, it is found at night in Patan’s old city. Every household creates on their road-side stoop mandalas of rice and painted flour lit by butter lamps. The narrow roads cornered by ancient temples are full of families strolling or going to prayer in the flittering, smoky lamplight. If there are no power cuts (and the government goes out of its way to avoid them during Tihar), cascades of Christmas lights decorate the taller buildings. Of course, modern times intrude. On Tihar, it is traditionally auspicious to buy metal; these days that means buying electronics, and so phones, televisions and stereos sell briskly. Luckily, when it is all over, I won’t suffer from withdrawal. There are of course many more festivals during the year but in the meantime I still have my neighborhood Hindu priest to remind me I live in Kathmandu. 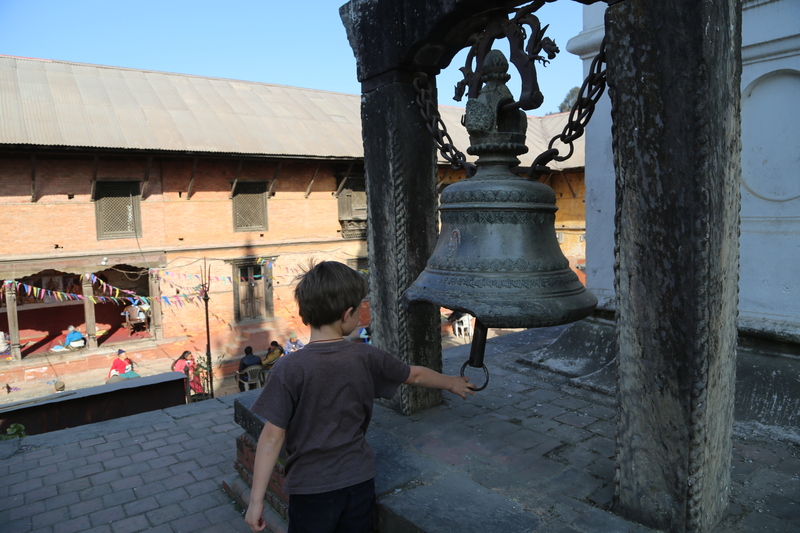 Without fail, 365 days a year, he starts clanking his bell to wake Shiva at 5:15AM. I lie in bed, counting the 25 to 31 reverberating sharp and hard rings occasionally enhanced with some megaphone chants. When I moved here a year ago, the head-thudding noise forced me up and out of bed but these days, it has a soothing quality, alternating with the baying packs of neighborhood stray dogs and the coo-ing pigeons on my windowsill. I roll over, a smile on my face, knowing that the ancient is still there to guard the new day. This entry was posted in beauty, family, hinduism, holy cows, Kathmandu, living overseas, Nepal, religion, religious festival, Shiva, temple, women and tagged beauty, brahmin, dashain, Donatella Lorch, festival, growing up overseas, Hinduism, Kathmandu, Kathmandu Valley, living overseas, mothers, Nepal, Nepal news, newar, pashupatinath, religion, shiva, shrine, south asia, Teej, tihar, women on September 9, 2014 by Donatella Lorch. Pilots do visual landings into Kathmandu, first skimming then dipping down sharply over the rims of the nearby hills that encircle the valley and stopping at the end of a runway that abuts the city’s downtown. There is no long highway into town, no time for visitors to slowly absorb the capital city’s chaotic traffic, smells, dust, colors or history. Everything is there —- immediately. Just drive through Tribhuvan International Airport’s huge orange and gold gateway, make a right, pass the golf course and you arrive, just a few hundred meters from the runway, at Pashupatinath, one of Kathmandu’s seven UNESCO World Heritage sites, and one the world’s holiest Shiva Shrines. It doesn’t look very sacred from the outside especially if you enter through the gauntlet of stalls selling religious knick knacks, but amid the huge bewildering pantheon of gods in Nepal, here you have reached the apex of Hindu spiritual power. The site, on the banks of the Bagmati River, the country’s holiest river that feeds into the Ganges, is in a big park and consists of a collection of temples, shrines and cisterns that were first built in the 4thc AD though the main pagoda styled temple was also rebuilt in the 17thc. These days, the Bagmati’s other claim to fame is its overwhelming filth. The river is dead, a thick, slimy grey liquid, lined by garbage and coating nearby neighborhoods with its choking stench. Added into the complex are a hospice and a temple doubling as an old age home founded by Mother Teresa where homeless elderly live amid devotees ringing sacred bells and making food offerings at the myriad mini shrines. Here Shiva is the Lord of the Beasts not the fearful and destructive Bhairab and devotees flock to worship him from all over the subcontinent and the world. Non-Hindus are not allowed in certain parts of the temple. I brought my four kids here so they could see, touch, smell and experience Hinduism and its rituals for the first time. 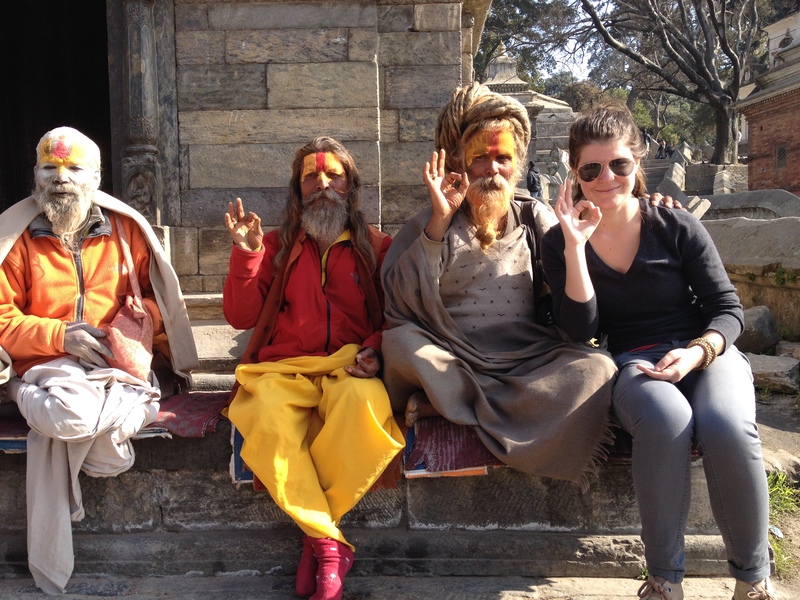 We share the shrine’s stone paths with devotees, tourists, wandering cows, scrawny stray dogs, beggars and what our guide calls “the Hollywood Sadhus,” the ash coated and orange-dressed bearded holy men who demand money for pictures. 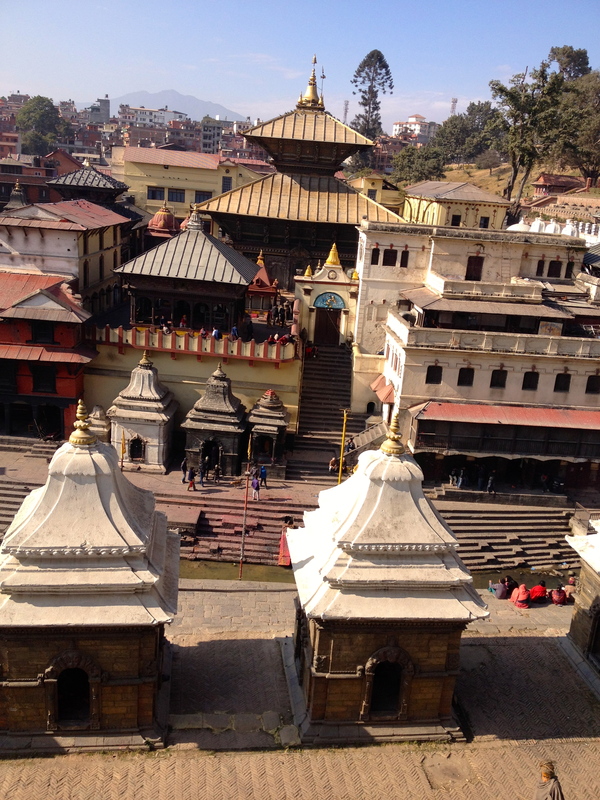 Pashupatinath is also a favored location for Hindu cremations. It is the open presence of death that I think shocks western visitors the most. 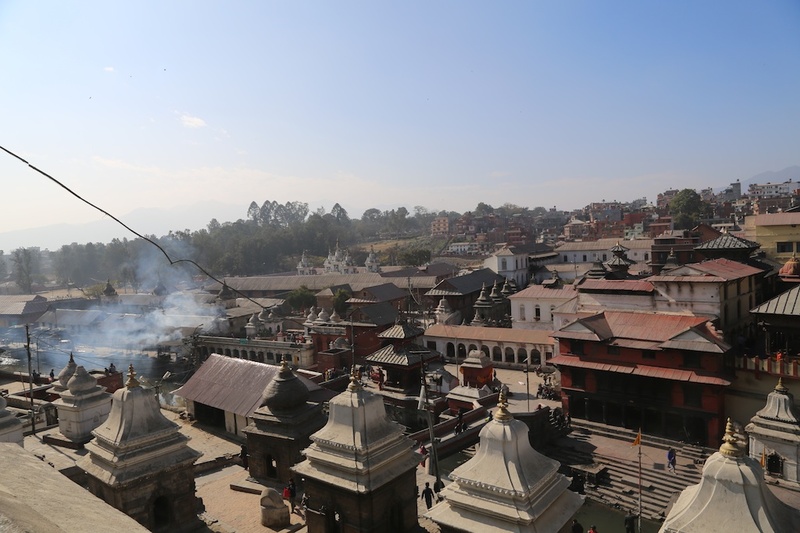 As the smoke from the pyres wafts over and around us, Richard, our Christian guide from India, brings us to a terrace overlooking two on-going cremations to describe the technicalities and the ritual. Bodies are cremated rapidly after death, preferably the same day. The body is first taken to the edge of the Bagmati and the feet dipped in the water, symbolically the last effort to see if they are still alive. It is then carried to the ghat and placed in a pyre of wood to burn between three and four hours. Women are fattier and take longer to cremate. The umbilical cord, which apparently does not incinerate, is buried in the soil of the shallow Bagmati, as part of the cycle of rebirth. 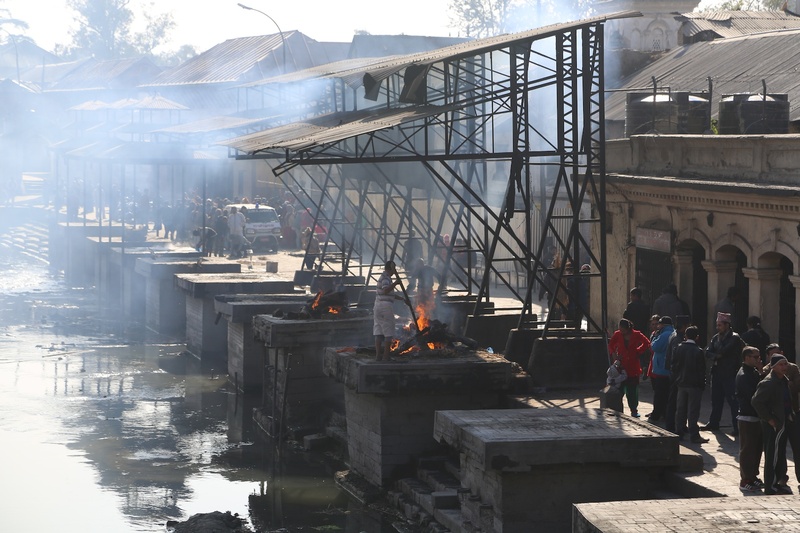 In a complex ritual, the relatives receive the ashes and then go to the other shore of the Bagmati for puja (worship) before giving the ashes to the river. The northern most cremation area is reserved for the royal family. Here in 2001, the king and queen and eight members of the royal family, who had all been gunned down by the crown prince, were simultaneously cremated. My eight year old is okay with all this. He has been living here for six months and sees cremations in the neighborhood temples where we live. The word “Puja” is an integral part of his vocabulary. He knows that pious Hindu adult sons must wear only white (shoes too) for a year when their father dies and when we drive through town, he regularly points out the men in white. He knows that for the first 13 days after a father’s death, a truly pious adult son lives alone and can only shower outdoors. He cannot touch anybody, eating only once a day boiled rice with ghee, lemon and fruit. He cannot sleep with his wife. My teenage boys, at school in North America and both argumentative philosophers, are keen to discuss the meaning of life. For my 21-year-old daughter, I think listening to the crackle of the pyre and watching the stoker push back embers around a protruding foot, is part surreal and part overwhelming. The public and physically intimate ritual of handling a dead person does not exist for us. When a relative died recently, we all said our goodbyes as she lay in a hospital bed. A few days later, we received the ashes. The ritual, if there was one, was highly impersonal. I wonder what the elderly who live in the next-door hospice think when the distinct smell of burning human flesh wafts into their abode. 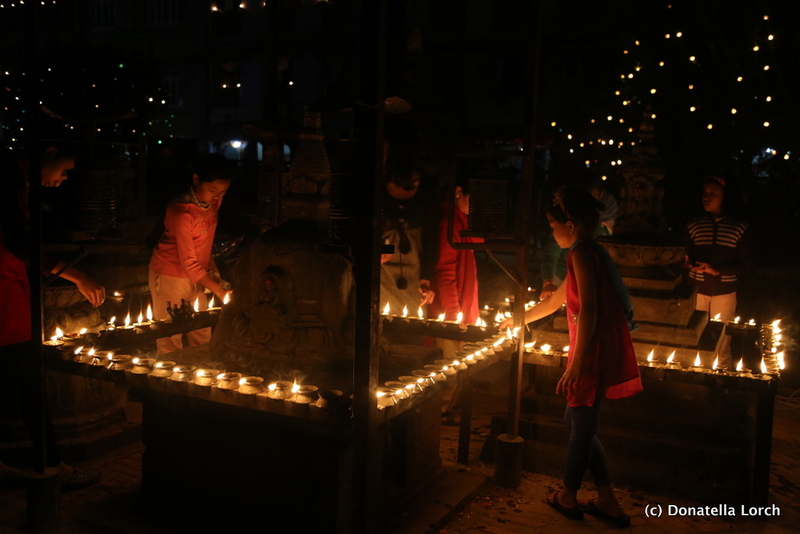 But Pashupatinath is not only about the dead. It is about a vast number of festivals, daily pujas and ceremonies. One of the biggest yearly festivals, the Maha Shivaratri (Great Shiva Night), falls on February 28th 2014. Thousands of Sadhus come from all over Nepal, India and the rest of the world for a week of prayer, smoking marihuana and bathing in the Bagmati. Some strip naked. Mark your calendars. This entry was posted in Kathmandu, living overseas, Nepal, Shiva, south asia and tagged cremation, Donatella Lorch, festival, Kathmandu, Kathmandu Valley, living overseas, Mother Teresa, Nepal, News, pashupatinath, religion, sadhu, shiva, shrine, tourism, unesco, World, world heritage site on January 22, 2014 by Donatella Lorch.